The OS-300-2 Durometer Test Stand is designed for use with the Check-Line AD-300 Analog Durometer. Use of a test stand significantly reduces the errors that are caused by measurements by hand which are sensitive to subjective test errors, caused by differing load application forces or non-vertical application of the durometer to the test piece. The OS-300-2 durometer test stand works on the constant load principle. To conduct hardness (durometer) measurements, the product sample is positioned on the support table. The Durometer is lowered down to contact the test sample by pulling the manual lever. The fixed-mounted durometer insures a predictable and repeatable perpendicular contact of the test samples. All measurement values are shown directly on the analogue durometer. 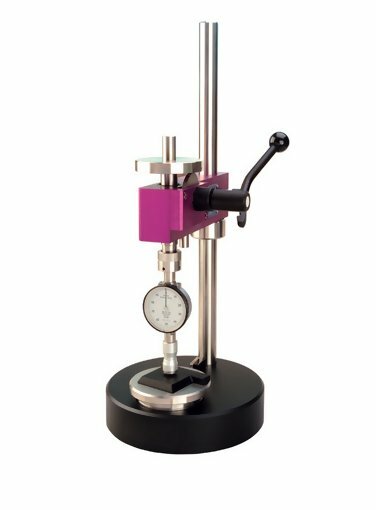 The test stand is made of rugged and light weight aluminum which provides convenient adjustment of the vertical position of the durometer to accommodate a wide variety of sample sizes and shapes. A mechanical overload mechanism is provided to prevent the durometer from making direct contact with the support table.